The simplified constructional diagram of a Minimum Oil Circuit Breaker (MOCB) is shown in the figure. It consists of two oil filled chambers namely upper chamber and lower chamber, which are separated from each other. The are extinction process is carried out in the upper chamber. So, it is called as an arc extinction chamber or current interruption chamber of Minimum Oil Circuit Breaker (MOCB).This chamber houses an arc control device, an upper fixed contact and a ring shaped lower fixed contact. The are control device is fitted to the upper to the upper fixed contact.The moving contact slides through the lower fixed contact such that a physical (or electrical) maintained between them. The entire assembly of upper fixed contact. 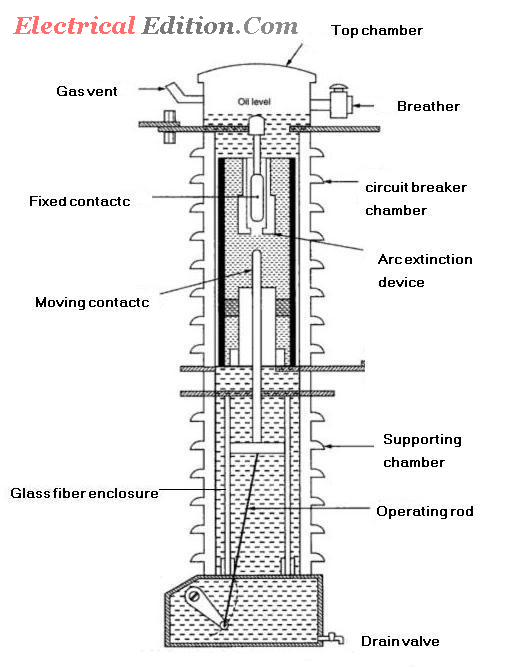 lower fixed contact and arc control device is enclosed in a glass fiber enclosure which is surrounded by oil. The oil present in the lower chamber does not involve the arc extinction process and instead it is used only for insulation purpose. So, the lower chamber is also known as dielectric supporting chamber. Both the upper and lower chambers are individually enclosed with the cylindrical shaped synthetic resin bonded papers within the porcelain insulators. 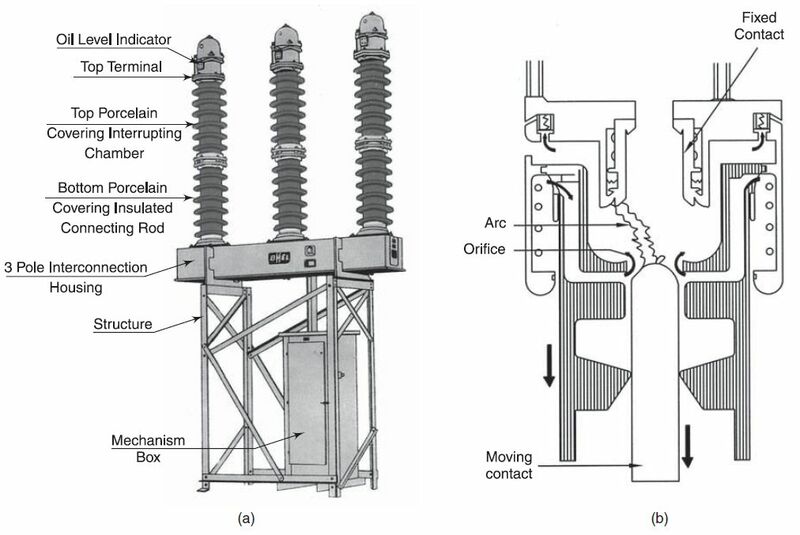 The operating rod which is permanently fixed to the moving contact is connected to the operating mechanism which provides vertical motion in order to make and break the circuit. Whenever the moving contact is drawn out of the. hollow structure of fixed contact, under current carrying conditions, an arc is drawn between them. As the contacts are present in the dielectric oil, the oil surrounding the arc attains a high temperature and thus decomposes the releasing gases. The gases formed will expand and so the pressure inside the chamber rises.Hence,the gases will move upwards by which the contacts cools down and the arc splits. The gap between the contacts will be filled with fresh oil. This oil will also be decomposed and the released gases will expand. So. the pressure will be increased again. Hence, the gases will move upwards and again fresh oil will enter. This flow of fresh oil through the gap between the contacts will continue until the final arc extinction which occurs near . current zero instant. In order to achieve sufficiently high dielectric strength immediately after current zero instant. either of the following method is implemented. (i) Forcing fresh oil into the gap between the contacts with the help of piston action produced by the piston attached to the moving contact. (ii) Maintaining high pressure on the oil inside the circuit breaker with the help of an inert gas. By this the fresh oil will enter into the gap between the contact from all directions and the gases moves upwards. 1. For indoor applications, minimum oil circuit breakers can be used upto 36 kV. 2. For outdoor applications, minimum oil circuit breakers can be employed upto the line voltages of 220 kV.